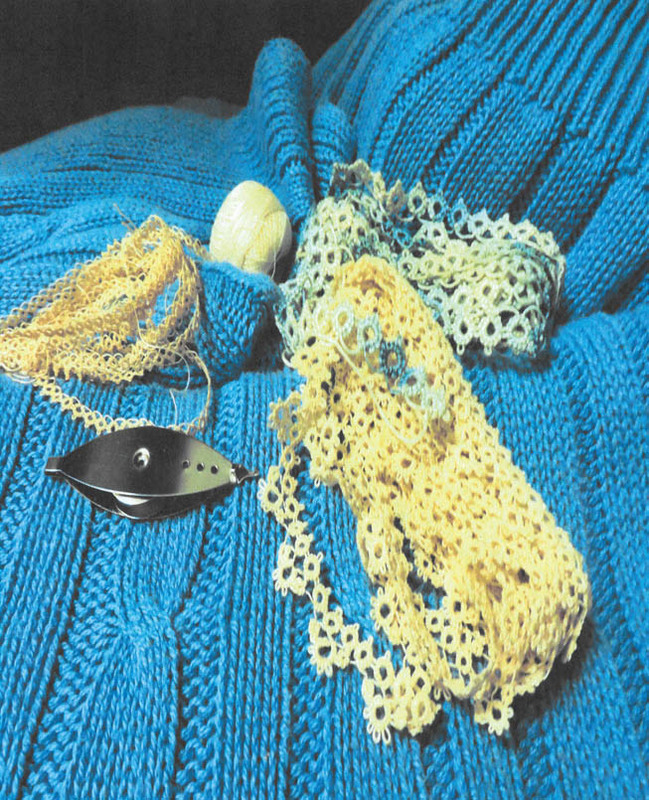 Vivian Hogue’s mother’s tatting shuttle and lace, the results of her labor. I think most of us pare down possessions as we go along, or flea markets and yard sales wouldn’t exist. This has to be done periodically to navigate one’s house, and especially his garage. A “garage” is for “parking or storing motor vehicles.” However, for many it is not for that purpose at all, but is simply an attic brought downstairs. For some it is for hoarding, and for others it is precious space for the now-silent 8-track player with the Donna Summer tape still gnarled inside. Its value is not in its functionality, but its importance to the owner’s more youthful past. One should study the outcome of “over-storage.” On occasion, I have been asked to adopt or sort through possessions of those who have “passed on,” as we say in the South. It brings to mind that I do not wish that duty upon my children, as they do not have space for what is mine, and they probably wouldn’t know what to do with a scythe or a tatting shuttle. Thus I began and completed a 2018 New Year’s resolution to spend the year cleaning up and cleaning out. It was fascinating to see what was important or needful to me, my parents and grandparents. Some are also important to me, as small and insignificant to others as they might be. Our children will have to assess the value of some things kept, but they will not see many of the associated recollections that go with them. What they cannot grasp is the regard for the people, things, eras and events represented. These would include those recollections that I and others have of a bygone-never-to-return era of Old Conway. People use the word “love” when they describe what they experienced before our town’s “persona” was changed in the 1980s. They’ll say, “I loved the many small cafes we had. They weren’t elegantly furnished and the plates were different styles, but the food and conversation was good.” Overalls and Sunday suits were a good mix and … oh, my – here’s an original menu. I must keep that! Look at this old 1953 city map. I’ll certainly never need that again. The city looks the size of a postage stamp! But it is a reference, and as I mentally “stroll” along the downtown streets today, I can tour Clarence Day’s Feed Store with farmers standing hands-in-pockets discussing the drought, and the butcher wrapping meat in white paper. We relished entering the drug stores with soda fountains and booths or wrought iron seating, and the five & dime stores with toys. “Do NOT touch!” said lots of mommas. “And don’t run in the store! If you do, you will not come next time!” And they would keep their word because they loved you. You behaved yourself because you loved the mostly-family-business world that was Downtown Conway. Several years ago, when our street was replaced, I lost my plea for the city to leave the concrete steps at our corner and simply place a ramp around them. They were historic, and as a small child I loved sitting on them in all seasons and waving to the now-and-then cars that passed. With today’s careless driving habits, no one could wave back or they would drop their cell phone. When we natives and long-timers hear the sentimental sound of the Union Pacific 844 steam locomotive coming through for a visit, we are immediately aware of various reveries. I’ve never known anyone who didn’t delight in our train depot, but some in the business district wanted Main Street instead. There was a valiant attempt to save it from destruction. It was yet another unheeded plea to save our local history, as we now envy all surrounding counties whose depots are on the National Register of Historic Places. As much as we wish, we cannot keep everything. The Gospel of Matthew tells us not to store our treasures for moths and rats to ruin and for thieves to break in and steal. But I do love the treasure of my mother’s beautiful 1920s calling cards. So back in the box they go until another day – to be loved again.